Long-term studies in Amazonia, Africa and central America show that while these botanical behemoths may have adapted successfully to centuries of storms, pests and short-term climatic extremes, they are counterintuitively more vulnerable than other trees to today's threats. "Fragmentation of the forests is now disproportionately affecting the big trees," said William Laurance, a research professor at James Cook University in Cairns, Australia. "Not only do many more trees die near forest edges, but a higher proportion of the trees dying were the big trees." "Their tall stature and relatively thick, inflexible trunks, may make them especially prone to uprooting and breakage near forest edges where wind turbulence is increased," said Laurance in this week's New Scientist magazine. Big trees may comprise less than 2% of the trees in any forest but they can contain 25% of the total biomass and are vital for the health of whole forests because they seed large areas. "With their tall canopies basking in the sun, big trees capture vast amounts of energy. This allows them to produce massive crops of fruits, flowers and foliage that sustain much of animal life in the forests. Their canopies help moderate the local forest environment while their understory creates a unique habitat for otherplants and animals," said Laurance. 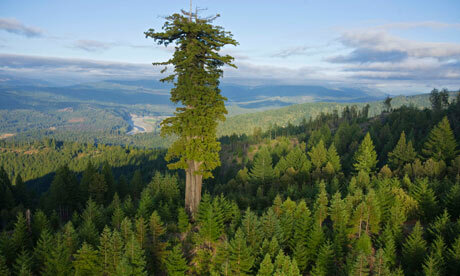 "Only a small number of tree species have the genetic capacity to grow really big. To grow into giants trees needs good growing conditions, lots of time and the right place to establish their seedlings. Disrupt any one of these and you lose them." In some parts of the world, Laurance said, populations of big trees are dwindling because their seedlings cannot survive or grow. "In southern India an aggressive shrub is invading the understorey of many forests, preventing seedlings from dropping on the floor. With no young trees to replace them, it's only a matter of time before most of the big trees disappear." According to Laurance, it is not just the biggest trees in the world that are suffering, but also the biggest in their communities. Dutch elm disease killed off many of the stateliest trees in Britain in the 1960s and 70s, and new exotic organisms and bacterial infections, often brought in from other continents via garden centres, are threatening oak, ash and other species. Longer lasting and more intense droughts, which are becoming more frequent in many tropical areas with climate change, are also taking their toll. Studies in Puerto Rico and Costa Rica suggest that big trees also suffer more in droughts than most other organisms, said Laurance. "In rainforests droughts promote surface fires that burn through leaf litter on the forest floor. Larger trees were initially thought to survive these fires but in fact many die two to three years later. In cloud forests, big trees use their branches and crowns to rake the mist and capture water droplets. Global warming could push clouds up to higher elevations depriving them of sources of moisture". "The danger is that the oldest, largest trees will progressively die off and not be replaced. Alarmingly this might trigger a 'positive feedback' that could destabilise the climate: as older trees die, forests would release their stored carbon, prompting a vicious circle of further warming and forest shrinkage," said Laurance. 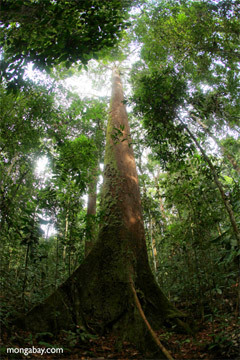 Many of the big trees are the oldest and most ecologically important inhabitants of the forest. In the Amazon, they are often 400-1,400 years old, in North America giant redwoods can exceed 2,000 years and giant sequoias 3,000 years. Already on the decline, demise of giant trees may be hastened by global warming. Already on the decline worldwide, big trees face a dire future due to habitat fragmentation, selective harvesting by loggers, exotic invaders, and the effects of climate change, warns an article published this week in New Scientist magazine. Reviewing research from forests around the world, William F. Laurance, an ecologist at James Cook University in Cairns, Australia, provides evidence of decline among the world's "biggest and most magnificent" trees and details the range of threats they face. He says their demise will have substantial impacts on biodiversity and forest ecology, while worsening climate change. 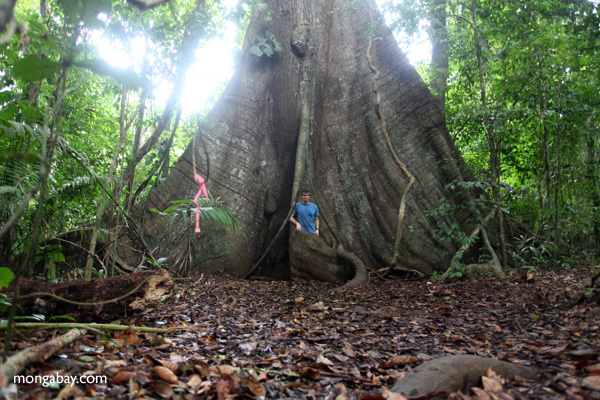 "To persist, big trees need a safe place to live and long periods of stability," he told mongabay.com via email. "But time and stability are becoming very rare commodities in our modern world." Giant trees offer critical habitat and forage for wildlife, while transpiring massive amounts of water through their leaves, contributing to local rainfall. Old trees also lock up massive amounts of carbon — in some forests they can account for up to a quarter of living biomass. Dipterocarps are commonly targeted by loggers in Southeast Asia. This Dipterocarp was photographed in Borneo by Rhett A. Butler. But their ability to sequester carbon and render other ecosystem services is threatened by human activities. Some of the world's largest trees are particularly targeted by loggers. The oldest trees are among the most valuable and therefore the first to be cut in "virgin" forest areas. Big trees are also sensitive to fragmentation, which exposes them to stronger winds and drier conditions. Laurance's own work in the Amazon has shown substantial die-off of canopy giants in small forest fragments. Their susceptibility seems counter-intuitive given big trees' life histories, which invariably include periods of drought and other stress. "All around the tropics, big canopy and emergent trees are succumbing to strong droughts," Laurance said. "That's been a surprise to me and many other ecologists, because big, ancient trees would have had to survive many droughts in the past." Forest giants may suffer disproportionately from climate change, writes Laurance inNew Scientist, highlighting research in La Selva, Costa Rica by David and Deborah Clark. "Trees are probably getting a double-whammy when the thermometer rises,' says David Clark. “During the day, their photosynthesis shuts down when it gets too warm, and at night they consume more energy because their metabolic rate increases, much as a reptile’s would do when it gets warmer.” With less energy being produced in warmer years and more being consumed just to survive, there is less energy available for growth.The Clarks’ hypothesis, if correct, means tropical forests could shrink over time. The largest, oldest trees would progressively die off and tend not to be replaced. Alarmingly, this might trigger a positive feedback that could destabilize the climate: as older trees die, forests would release some of their stored carbon into the atmosphere, prompting a vicious circle of further warming, forest shrinkage and carbon emissions. Laurance notes climate change is having less direct impacts on forests, including creating conditions for exotic pathogens to thrive. For example, pathogens such as Dutch Elm Disease, introduced by trade or circumstance, can devastate native forests. Giant Kapok tree in the Brazilian Amazon. Photo by Rhett A. Butler. All told, the outlook for big trees is not good, according to Laurance. "The decline of big trees foretells a different world where ancient behemoths are replaced by short-lived pioneers and generalists that can grow anywhere, where forests store less carbon and sustain fewer dependent animals, where giant cathedral-like crowns become a thing of the past." FORESTS NSW has asked police to investigate thefts and vandalism to a logging contractor’s machinery near Batemans Bay over the weekend. Forests NSW Southern Region manager Daniel Tuan said the thefts of radios, tools, GPS equipment and other material worth thousands of dollars had taken place in Boyne State Forest on Friday night and was discovered on Saturday. On Sunday night vandals broke into the same four pieces of machinery and set off fire protection equipment. “These thefts of essential and expensive equipment can be a lasting setback to forestry operators,” Mr Tuan said. “UHF radios are an essential operating and safety measure. “Operators of these pieces of heavy machinery have to be aware of each other and visitors to the workplace. “The GPS equipment is used to help the contractors comply with the exacting operating procedures they work under to ensure they are harvesting in an environmentally sustainable manner. Mr Tuan said the vandalism of the fire protection units was also a risk to operator health and safety in a difficult workplace environment. Forests NSW is harvesting spotted gum sawlogs from Boyne State Forest for the local sawmill industry. There is a long history of harvesting in the area. In solidarity with Victorian conservationists in the Central Highlands, protestors from South East Forest Rescue (SEFR) last week claim to have halted logging operations Boyne State Forest north of Batemans Bay. The conservation group claims to have found more illegal logging in Compartment 99 and is calling for an end to native forest logging on public land. 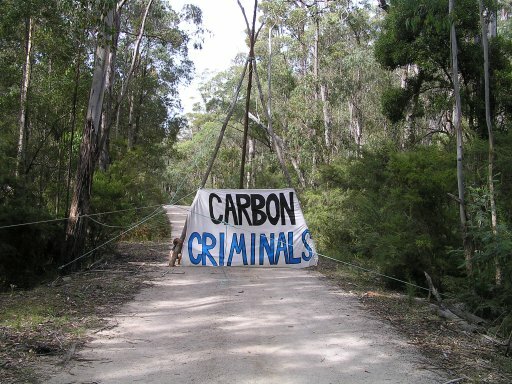 Their action saw four logging machines attached by high tensile steel cable to a structure in a tree 20 metres off the ground, and a banner stating “Carbon Criminals”. Boyne State Forest is part of the National Estate Register, contains records of nationally listed endangered species, as well as state-listed species, such as swift parrots, yellow-bellied gliders, masked and sooty owls. South East Forest Rescue’s nocturnal fauna survey revealed greater gliders, feather-tailed gliders and sugar gliders as well as micro bats. SEFR have demanded that the state-run logging agency Forests NSW guarantee there will be no impacts on the environment as a result of the logging and to guarantee any logging Forests NSW and their authorised contractors undertake will not impact on the health and wellbeing of the citizens of New South Wales, being both present and future unborn generations. “The Office of Environment and Heritage upheld these breaches,” Ms Stone said. “Old-growth forest, ecologically mature forest, was logged. The Shire of Manjimup in south-west Western Australia says the return of workers to the Deanmill timber mill is a significant step forward for the town. Dozens of timber workers lost their jobs when Gunns Limited closed the mill early last year. Auswest Timber, which bought the mill in December, switched its saws back on this week, employing 31 new workers. It plans to employ 20 more when the mill is officially opened in March. Shire president Wade De Campo says the future of Manjimup's timber industry is looking bright. "It's created optimism I think in the air of the community," he said. "Coupled with plans that we have for the timber industry for long-term as a local government, then I think the future is bright in that regard. Following the reports on unlawful logging in State forest on the south coast, the conservation group South East Forest Rescue today found more illegal logging in Yambulla State Forest. This is the third time these type of breaches have been discovered in these particular compartments. The conservationists are calling for a halt to native forest logging operations. The compartment contains records of nationally listed endangered species such as Glossy Black Cockatoos, Smokey Mice, Southern Brown Bandicoots, Tiger Quolls, Eastern Pygmy Possums, Bent Wing Bats, Yellow-bellied Gliders, Gang Gang Cockatoos and White-Footed Dunnarts. Environmentalists used a large wooden tripod attached to a structure in a tree 25 metres high with a person in it to halt logging operations south of Eden on the New South Wales far south coast. There were four Rocky Outcrops in Yambulla State Forest Cpt 444 that have been logged. This is unlawful under the licence conditions. (Eden Region TSL regulation 5.11). 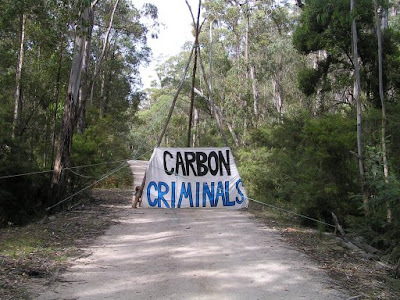 forest offenders of serious environmental damage as they are prosecuted on private land." Prime Minister Julia Gillard has urged environmentalists to stick with Tasmania's forest peace deal, despite their concerns about a new conservation agreement. The state and federal governments last week gave Forestry Tasmania approval to continue logging 2,000 hectares of the 430,000 hectares of native forest earmarked for protection. The Government insists it is necessary for industry to meet existing contracts, but the Greens say it is a breach of the original peace deal. On a visit to the state, Ms Gillard said it was just an interim agreement until the conservation value of the forest was properly verified. "The process has been agreed to, Jonathan West was the person agreed to, so I do expect people who have been in that process every step of the way to hold to the process that they agreed to," she said. "When you read the agreement we always said that we would be guaranteeing wood supply for current contracts and we've done that. "As a result of the interim conservation agreement Minister Tony Burke signed, 99.5 per cent of the nominated area for interim protection is being protected." The Greens are disappointed that while in the state, Ms Gillard did not take up an invitation to visit disputed areas. One protester remains in a 60-metre-high tree-sit. Greens Leader Bob Brown says members of Still Wild Still Threatened asked Ms Gillard to see the forest first hand. "She hasn't taken up the invitation from Miranda Gibson, who's sitting 60 metres up in a tree below Mount Mueller in the World Heritage Area," he said. "[Ms Gibson] has been there for four weeks in a coupe the Prime Minister says would be protected." The start of 2012 coincides with a new Forestry Tasmania vision for the industry. Their forestry innovation plan released late last year outlines what they describe as a once in a generation opportunity to re-engineer Tasmania's forest sector. The plan takes into account the fact that under the intergovernmental agreement there will be less timber available from native forests, at the same time as increasing supplies from plantations. Forestry Tasmania's managing director Bob Gordon says the market is looking for certified wood products, and in particular, engineered products made hardwood and softwood, and from a mix of native forests and plantations. Bob Gordon says its about diverting products from the woodchip market, into innovative, engineered wood products.